Mishfit will be exhibiting along side Rachel Mortimer & Angela Smith, as Flesh & Bone Collective. 3 very different artists united by their love of the human form and Figurative painting. 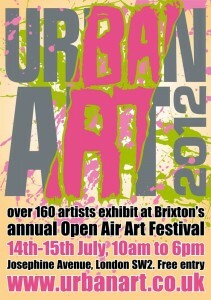 Showing together for the first time at the London Urban Art Fair. It is London’s largest annual alfresco Art Fair and started a decade ago. 2012 will be its tenth birthday and residents of Josephine Avenue will be transforming their sleepy, tree lined street into a bustling exhibition space. With over one hundred and fifty photographers, printers and painters exhibiting this is our biggest event yet. Entry is FREE and with prices ranging from under a tenner to over a thousand pounds this makes it a truly affordable event for all art lovers, whatever your budget.